May marks our third annual Mid-City Safety Month. The goal of Safety Month is to strengthen Mid-City’s safety culture through special programming and training for our 350 field electricians and technicians. This year, we’re looking to build on the past two and continue with bonus trainings and outreach. 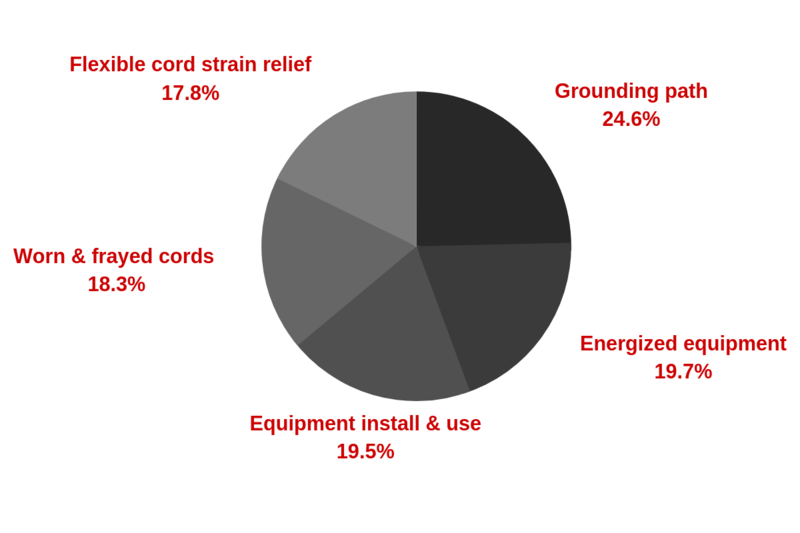 In the spirit of the upcoming safety month, we’re breaking down the most frequently cited serious electrical violations that occurred in 2018, according to OSHA.gov. In other words: Conductors must be grounded correctly and free of faults. Compliance Example: If an outlet was not properly grounded, it could cause someone who plugs something into that outlet to be shocked, or much worse, electrocuted. To prevent this kind of injury and comply with this standard, we use something called a GFCI (Ground Fault Circuit Interrupter) in case there is a fault in the ground. If there is a fault present, this will stop the flow of electricity by tripping the circuit and shutting off the outlet completely. In other words: Do not perform work on energized (also known as “hot”) equipment. This requirement is fairly self-explanatory, and the risks involved with violating this regulation can be fatal. Working on energized equipment can lead to an arc flash, which is deadly. The only exception to working on energized equipment is if de-energizing causes even greater risk. Compliance Example: An electrician is working at a hospital, and must perform maintenance to generator equipment that is supplying power to life support. In that scenario, the risk for harm is greater if the equipment is de-energized. In order to work hot though, the electrician and project manager must complete a stringent process that includes Owner acknowledgment, additional permits, and specialized personal protective equipment. These circumstances are rare. In other words: Equipment needs to be used for the purpose it was made for, and also installed according to the manufacturer’s specifications and requirements. Compliance Example: An electrician would not use a generator that’s intended to power a small, home appliance that runs on 110 volts, to power a large, industrial piece of equipment that operates on 277 volts. That would overload the circuit and blow the fuse, which could possibly lead to a fire as a result of wires overheating. In other words: This one is also fairly obvious, and means that any kind of wire, from extension cords to Cat6 cable, can’t be frayed. Frayed cables can potentially cause fire or shock. Compliance Example: An electrician is working at a site and has been using the same cord for months. Eventually, the overuse causes the wire to become exposed. He throws the cord away because its no longer properly grounded by exterior protective coating, and could cause someone to be shocked if they picked it up. In other words: You need to use something that is non-conductive to reduce tension on flexible cords when hanging them from the ceiling, or anything else on the site. We typically use plastic “S” hooks to run our cords, which are non-conductive. In case a cord does have exposed wire as a result of wear and tare, the “S” hooks would prevent the cord from energizing whatever it came in contact with. Compliance Example: An electrician is moving temporary power from one part of the site to another. When relocating the cords, he handles them by the “S” hook that is suspending it from the ceiling, instead of grabbing the cord directly.